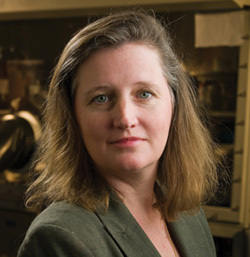 Sue Carter, professor of physics at UC Santa Cruz, has been named chair elect of the American Physical Society's Topical Group on Energy Research and Applications (GERA). GERA works to the connect the many types of physicists investigating how to generate, store, use, and transmit energy with as small an impact on the Earth's environment and resources as feasible. The group fosters the education and networking of scientists and engineers active in these fields and the next generations of researchers and educators. Carter's lab at UCSC focuses on energy-related research, including photovoltaics (solar cells), solid-state lighting, and luminescent solar concentrators.